If you have always wanted an antique bathroom vanity you are not alone. More and more people are searching through antique stores and thrift shops in search of the perfect dresser, buffet, or other vintage furniture item to act as the base for the vanity of their dreams. Anything else that will hold a sink and hide the pipes will work as well. While any furniture can be used it is best not to choose items that have great historic significance or value. By changing the antique furniture into a bathroom vanity you will be gaining charm but the piece will be worthless as an antique. It is wise to keep this in mind when shopping. You will want a sturdy antique that is in good shape. It is important that you buy a piece of furniture that is not too small or too big and will fit in your bathroom well. Make sure it is a style or period that compliments your décor. When you find a piece you think will work, check the legs and the joints carefully. Be sure that they are strong and will hold the bathroom hardware that you are planning to install. Look for worn places, cracks, and especially places that seem to have been repaired. 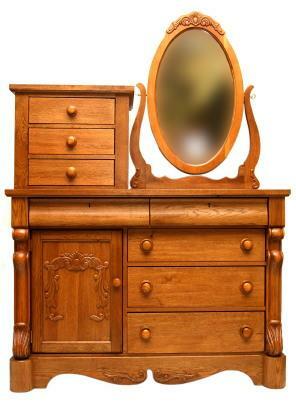 There are some challenges in converting an antique dresser into a vanity for your bathroom. Since the item was not really created to be a vanity it will more than likely not be waterproof. You will need to seal it so that it will not be damaged by water, steam, and high humidity of a bathroom.Vintage furniture was not made to accommodate a sink of any sort. There will be no hole for the sink to be placed in because the wash basin would have been placed on top of the wash stand. There will be no plumbing and no place for faucets. The back will need to be removed from the piece in order for the pipes to be attached. If there are drawers, they will interfere with setting the sink as well as the pipes. The drawer fronts will need to be permanently attached to the front of the piece and the drawers themselves should be removed. When choosing faucets, consider the age of the antique as well as the style and buy fixtures that are appropriate to the time. Mixing Craftsmen fixtures with a Rococo buffet would not work very well for most people. Think about the style of your project and choose a basin that compliments the look of your antique vanity. You may want to choose a basin that actually sits on top of the vanity giving it even more of an antique look. There are several different ways to make bathroom vanities. If you are a do it yourself type this is a good way to get exactly what you want. Look at each site carefully and choose the instructions that are the easiest to follow for you. Canadian Home Workshop uses reclaimed materials to create a "new" antique vanity. Ron Hazleton has some great instructions and pictures about how to convert an antique into a vanity. Once your antique bathroom vanity is installed you just need to check the seal around the sink and faucets regularly to make sure that they are in good condition. If the caulk has become old and worn, peel it off and caulk again with a silicone caulk especially for bathroom projects. Taking care of your new antique will keep it looking good for a long time.